Visiting the Grand Strand in November is always a good plan. The weather is pleasant, with average daytime temperatures a balmy 70-75 degrees, and only a minimal number of tourists. 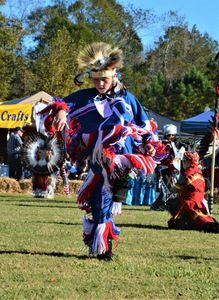 However, one of the best reasons to visit in the fall is that for twenty-six years, the Waccamaw Indian People have held their annual Pauwau (also called a powwow, it is a social gathering) in November, inviting numerous other regional tribes to participate. The tribes strive to educate the public in all things Indian—history, arts, foods, and crafts. 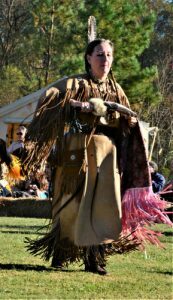 Come to the Pauwau to witness the culture of the Waccamaw Indians in traditional regalia; sit in a tipi, throw a tomahawk, purchase authentic jewelry or clothing, dance, and pray at the Fire Circle. Drumbeats bounce off your eardrums, while the tinkles of bells add a high-pitched tone to the throbbing sounds. The ceremonies begin with a solemn prayer in the Fire Circle, giving thanks to God, who provides all things. Tradition forbids photography during this sacred ritual. Prior to the ceremony, elders use burning sage to purify the Fire Circle. Tribal Chiefs and elders move to the four compass points of the prayer circle and pray. Next, the Indian Veterans invite any Veterans in the audience to join in the Veteran’s Dance. 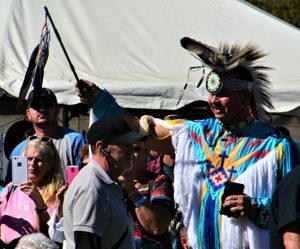 Throughout the afternoon, the crowd is entertained with various dances, including the traditional grass dance, which prepares the ground for the events to follow, such as the Fancy Dance, the Jingle Dance, the Women’s Traditional Dance, and the Smoke Dance, with separate dance events for men, women, and children. Between events, make your way around the grounds to view handmade goods of every description: jewelry, clothing, walking sticks, and even brooms. You will not go hungry either, with numerous meal choices and snacks available, like buffalo burgers and Indian fry bread. 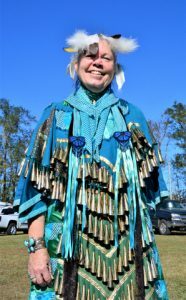 In 2005, the Waccamaw Indian People made history by becoming the first tribe in the state to obtain official recognition from the South Carolina Office of Vital Statistics. 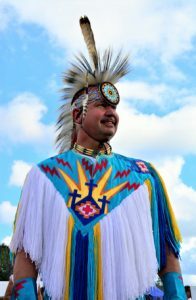 Today, there are eight state-recognized tribes in South Carolina. The Waccamaw Indian People of Conway are the descendants of a group of people who lived and farmed in the area of South Carolina now known as Dog Bluff. In 2004, they acquired 20-acres of land in the Dog Bluff community near Aynor, South Carolina. Dog Bluff is the ancestral homeland of the tribe, so by attending a Pauwau, you walk on the ancestral ground.